It’s a rainy day in the neighbourhood and I’ve been up to some serious cooking. I made what may be my final batch of salsa for the year, although there are still a large number of tomatoes out on the vine trying to ripen so I may have to put those guys to use in yet another batch. I tried growing tomatillos this year for the first time ever, those little husked cousins of tomatoes that you find in Mexican cooking (they’re what makes “green salsa” green). Despite being a typical Virgo that’s usually organized up the wazoo, when it comes to new and exciting plants, I have this problem of diving in before I do my research. 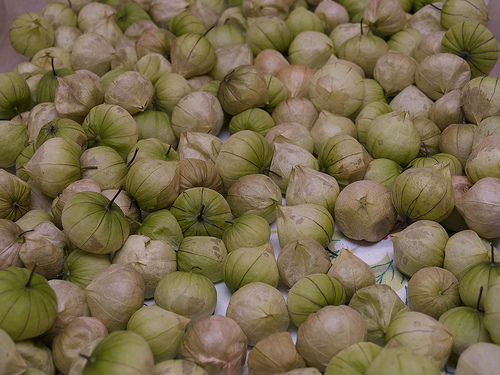 Such as it was with the tomatillos. I bought four Purple Heirloom seedlings from the good people at Urban Harvest at the Green Living Show this spring, and I stuck them in the back of my little patch, completely heedless of the warnings of my friend Adria, the Ecoholic, who told me she was entirely overwhelmed with them last year, they grew so profusely. Three of the plants survived and literally took over the garden. I think next time I’ll try putting them in big containers. The breadth of the plants is tremendous and had I left them alone this fall they just would have kept going. Unfortunately the plants were hit with a bad case of mildew (damn rain) so I ended them – harvesting everything I could, even though I wasn’t entirely sure if they were ready. I left them in the basement in a tray near the dehumidifier to dry out and discourage any further mildew. And this weekend, it was salsa time! I roughly followed a recipe in my Bernardin canning book, but they call for adding cumin and red pepper flakes which I didn’t want to do. I had plenty of jalapenos still in my garden so I roasted them up with some garlic and added an onion, salt and some lime juice. I roughly chopped everything and cooked it all down for about 10 minutes and then took the immersion blender to it, to make it smooth and consistent. Once everything was cooked down I just canned as per usual, processing for about 15 to 20 minutes. I’m feeling a bit frustrated with my jars though. I really, really like the wide-mouth 250 ml jars – they’re easier to handle than the taller ones and nicer to serve from, but they don’t seem to seal as consistently. I made a batch of roasted tomato salsa about a week ago and I had to freeze nearly half of it because the jars didn’t seal down well enough. I’ve tried processing them a few minutes longer too but I don’t know what the problem is. Combine all ingredients in a large stainless steel saucepan. 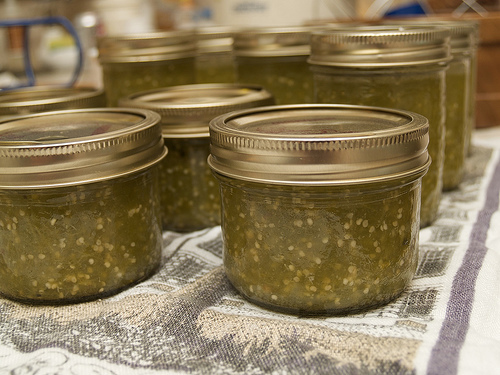 Pack into sterilized jars (look here for basic canning instructions). Process 250 ml jars for 15 minutes in a boiling water canner. Allow to cool. Any seals that haven’t ‘popped’ should be frozen or refrigerated and eaten quickly.